Are Jack Russells a good pet for children? When anyone asks us that question, we always tell them it depends mostly on how they train their terrier, and how they train their kids. In general, we don't recommend a terrier for children under the age of six, although it certainly can work out fine if the owners fully understand the nature of the dog, and are willing to handle the situation accordingly. Terriers are VERY assertive little characters. 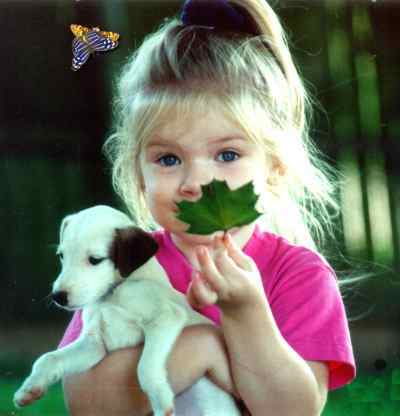 They have wonderful temperaments, and quite often love children. BUT, they will NOT take pulling on ears or tail, taking bones, food or toys away, etc. Most will react gently, often with a harmless grumble.... but if that sort of thing is permitted to go on, and the child doesn't get the message from the terrier, a stronger reaction is likely. 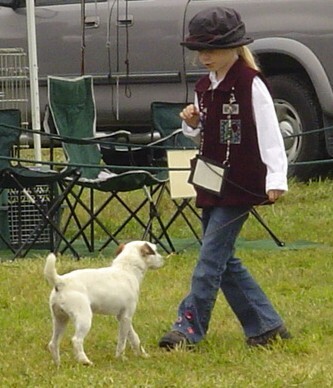 If you are of the mindset that the child can do anything, and the dog should NEVER react no matter what, then a terrier is NOT for you. Most importantly, be sure to read ALL of the information on the JRTCA's website, www.terrier.com. We have three grandchildren, and our terriers are great with them. When they visited as babies, Brady would sleep nearby as though he were "keeping an eye on them." We started introducing them to puppies at a very early age. 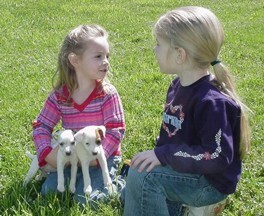 Kasey (pictured at top), at five years old (now 11) has been around the dogs extensively since she was born. She was taught early on, by us and by a couple of the old terriers, to handle them with caution and kindness. If she would trip over them, or get too rough, old Brady or Cooper would sometimes grumble or even snap a little, but would never hurt her. She and the terriers learned to respect each other, and she loved and enjoyed them and still does. They slept next to her, she combed their hair, and talked to them endlessly. She also played with any new pups as soon as they were old enough to leave Mom.... which is the best socializing any pup could have. All the terriers still look forward to her visits. She is now working in the field, helping at trials, and on her way to becoming a true terrier-woman. Kent & Nicole now have their own Jack Russell, one of Maxie's sons named Wrecks.